We had long known that adding some sort of molding feature to our hallway was in our future… and now we’re just kicking ourselves for waiting so long. It cost us a mere $57 for the materials (we did buy a tool on top of that, but we’ll get to that in a second) and it only took a few hour-or-two-long work periods over the course of 6 days (including some break days for paint-curing) to finally bring some oomph to our boring hall. So anyone who’s looking to tackle this on nights and weekends could hopefully do it within a week since each step only took a few hours and could be spaced out across each evening. We were inspired by a few other tutorials – like Ana’s, Kate’s, Sarah’s, and Emily’s – and took pieces and parts of each to figure out what worked best for us. So our tutorial below may not be exactly what your space needs, but between the lot of us there should be a fitting solution in there! Let’s just say that we learned that there are many different ways that you can approach board and batten, so a lot is about personal preference, what suits your home, etc. To start, we measured the space and planned our materials. My graph-paper sketch was probably overkill, but it made me feel better. It helped us plan how many boards we needed for the top rail and ledge, as well as count how many battens (the vertical strips) we might need. Next up was a supply run. We had most of what we needed on hand, so the only four items that we ended up purchasing are pictured below (the nail gun being a belated birthday gift from my sweet wife who was just waiting for me to pick out the one I wanted). Update: The nail gun shown below is no longer sold, but we’ve switched over to using this compressor-less nail gun these days anyways. 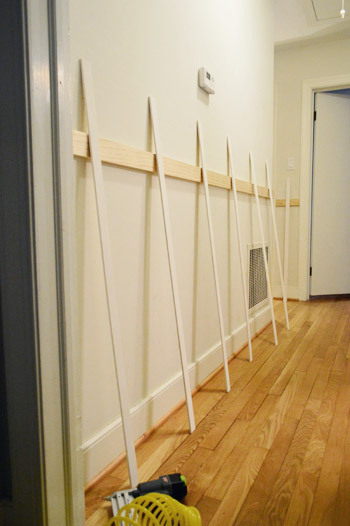 Before attaching them to the wall, we had to do a few things – like deciding the height of our board and batten. We first assumed “the higher the better!” and held it just under our light switches and thermostat. But after stepping back, we realized the high placement was just making our eight foot ceilings look lower than they already are. 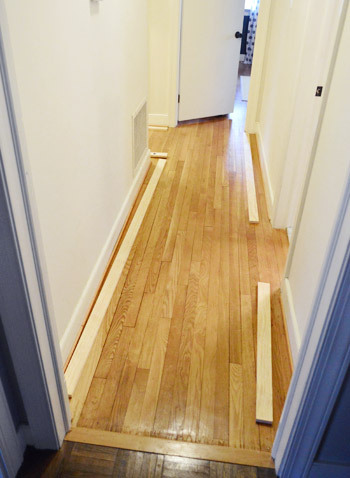 So, as you’ll see, we later landed on a more traditional height of 40″ off the floor, which is a lot closer to the “traditional range.” But again, many aspects of installing board and batten are just a personal preference thing, so go with whatever you think looks best for your space. 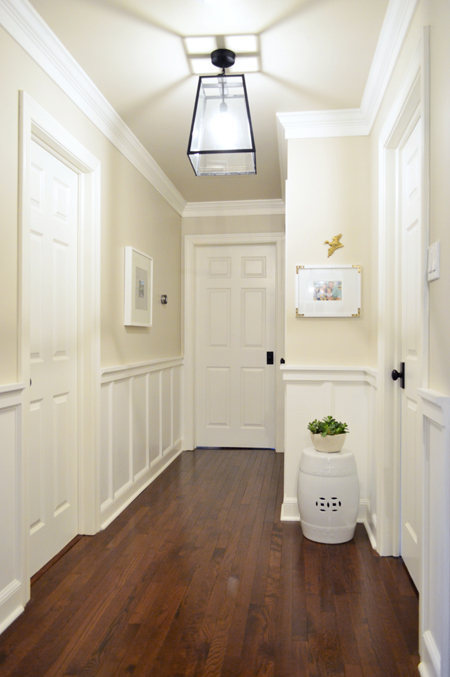 I’m sure rooms with tall ceilings or ornate crown molding might look awesome with higher board and batten (as well as mudrooms and other entryway areas, etc). Next up was nailing the rails into place with my new pneumatic (i.e. air compressor powered) brad nail gun (the one photographed has been discontinued, but we switched to using this air-less nail gun anyways). This was my first time ever using one and it intimidated me the first few times, but now I’m in love with it (not as much as Sherry, who says she wants to marry it). I’ll write a separate post about it later, but let’s just say it was the saving grace of this project. It probably would’ve taken us three or four times as long to complete the construction portion of this project without it. We bought a pretty basic, but well-reviewed Craftsman model (here’s an affiliate link to it for ya). 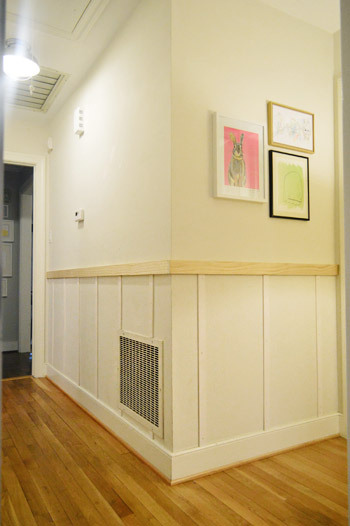 We used lattice strips at Sarah and Emily’s suggestion because they were cheap (66 cents per foot!) and they didn’t stick out past our existing baseboard. 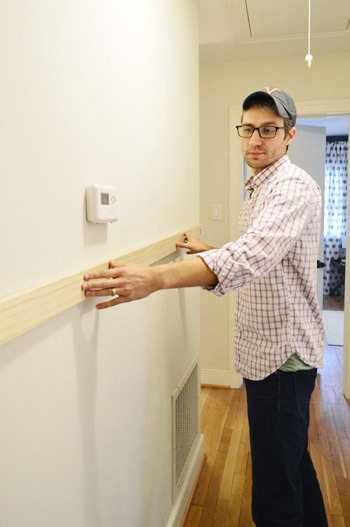 Had we used 1 x 2″ boards like some folks do, it would’ve hung over our baseboards. We could’ve replaced our baseboards too, but then they would’ve stuck out past the trim around the four (count ’em four!) doors in our hallway. So yes, chunkier battens could be nice in less narrow spaces (we didn’t want ours to jut out too far and close things in) but in our case we actually thought the lattice + rail setup was ideal and we like the dimensional-but-not-crazy-thick result. Lots of the tutorials we saw included adding a ledge along the top to sort of beef things up or create a spot to lean art or other items. We bought some 1 x 2” pine for this purpose but as soon as we held it in place we realized we didn’t really like it. Since it wasn’t going to be a functional ledge for us, it basically just narrowed the hallway more and created a few hazardous little corners for tiny heads to walk into. So we scrapped the idea, returned the wood, and enjoyed calling the construction phase: COMPLETE. 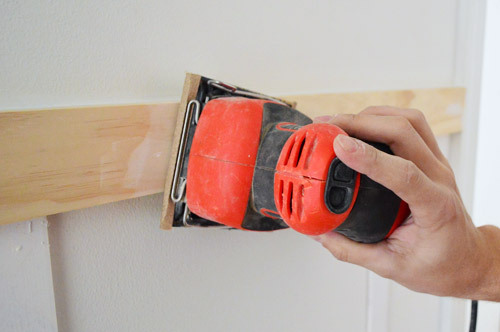 Later that day we broke out the palm sander to get rid of any excess spackle around the nail holes. After that, the rails and battens were ready for primer. 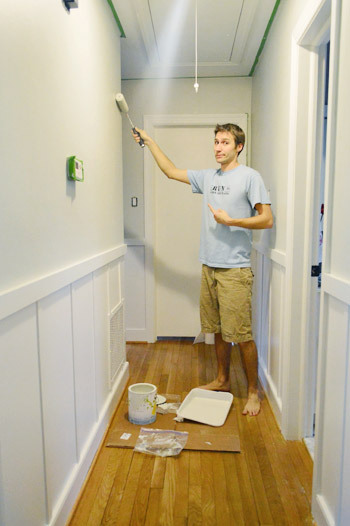 We already had Kilz Premium (which is a stainblocking primer) on hand, so we used a brush and a small foam roller to put one coat of primer on each piece of wood to prevent any bleed-through in the wood down the road (always a worthwhile “insurance” step). And we went over the battens too, just to be safe (even though they came pre-primed). Here’s the whole thing primed and almost ready for paint. Just had to let the primer dry. Admittedly, the finished picture of the painting step isn’t very dramatic since the walls above were still off-white. So after letting the paint cure for a couple of days we tackled painting the walls above the board and batten. 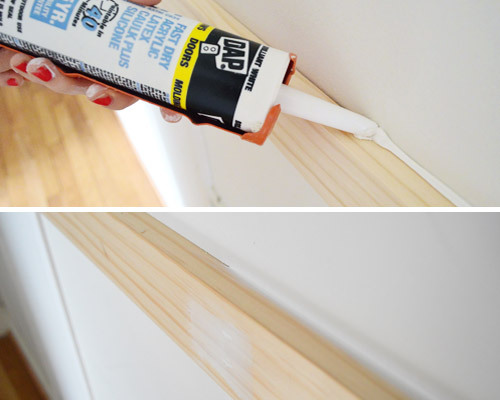 Sherry was still nervous that taping the freshly-painted top rail could peel paint off, so she opted to cut in by hand around the top rails (you can read her tips for doing that here and watch the video in this post and the video here for even more tips). She did a great job, despite not having her usual short-handled brush handy. 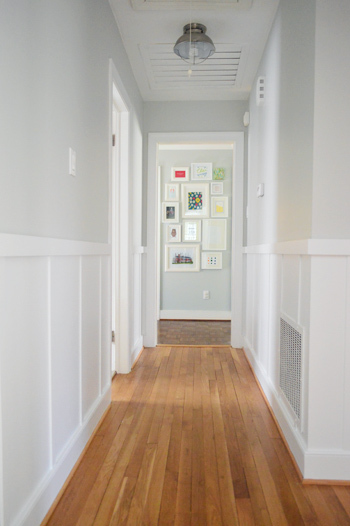 Note: we still have to paint the trim in the frame hallway the same white color as the board and batten. Okay, so let’s break down the budget. 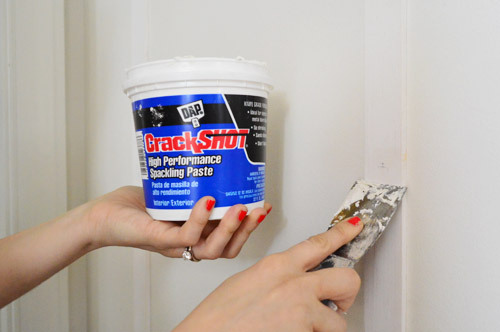 We only spent money on three items since we had things like paint, spackle, and caulk on hand. And had we actually purchased my nail gun back at my birthday in November as planned, our total cost for the project would’ve been only $57. Crazy, right?! But if you’re doing the nailing by hand it might take longer (which explains why Sherry had the urge to make out with our nail gun). Oh but if you don’t want to buy one, you can always rent one from your local home improvement store, so that’s another option. UPDATE: We repeated this project in our new house, but with a twist to make it feel a little bit fancier. 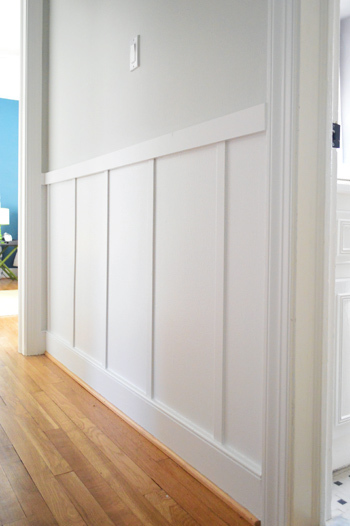 Check out the tutorial for our new twist on classic board & batten here. Aw, you’re welcome Taina! Good luck! Love, love, love it!!! This turned out so good and the tutorial is great. I’ve read other blogs for steps on this, but they always seemed to overwhelm me. This made board and batten seem totally doable. Can’t wait to tackle this project at our house. The girl is a sleep champ! She can’t fall asleep when there’s banging, so we hold off while she goes down for her nap, but after she’s sleeping we’re good to go! I think she’s so used to sleeping through hammering and barking (both of those things go on insanely regularly around here) that it just works for her. I’m curious about how you kept the spacing around the corner, and when you came to things like the vent on your wall. And tips for situations like that? We just kept the spacing consistent (and followed the studs) so when they intersected the grate we just cut the area out where the grate sits and nailed them in at those increments on top and bottom of the grate so it all looked as seamless as possible. Looks really great. 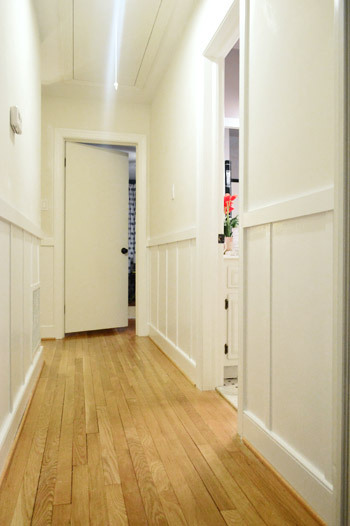 Would you say that this would make a hallway look larger/narrow or shorter? Which type of hallways to you recommend this for? 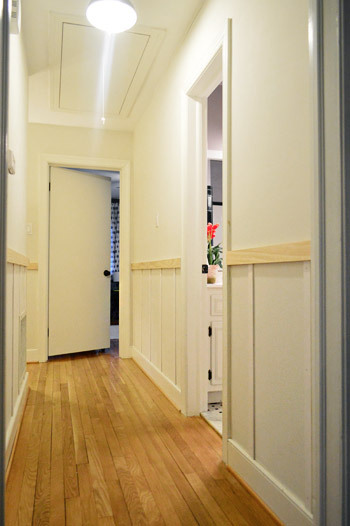 Our hallway is only 40″ wide, which we think is pretty narrow but we think it opens things up and makes it feel wider! Sort of like how thick bands of horizontal color on a dress or shirt can make a person look wider? Haha! I would think this could work in nearly every hallway. Hope it helps! I absolutely love it! It looks fantastic! 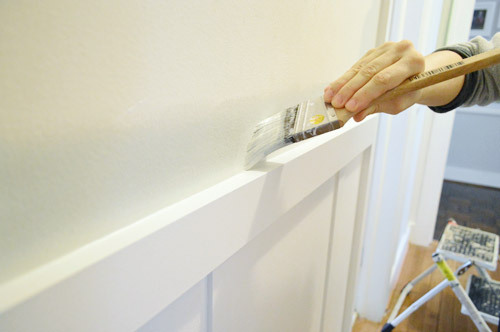 I really want to do this in our house, but we have really nice (and super expensive) 8 inch wood trim in our house, so now white trim for us. Don’t get me wrong, I love the natural wood trim, it just makes me sad when I can’t have crisp white board and batten haha. Aw man, maybe check if there’s any wood board & batten around and add some of that? Could be really pretty! It looks great! I was wondering how wide your hallway is? i would love to do this in our hall, but I’m afraid it might be too narrow. It’s 40″, so fairly narrow I think! Thanks for the videos. 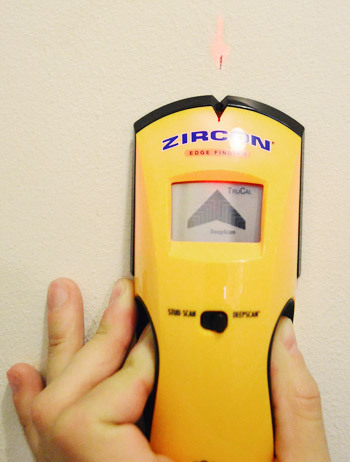 I’ve been measuring my walls and ready to dive in and didn’t even think of a laser level. How much easier is that?! I like the lattice too. Saves money so you have more for the shelf and moulding if you want to go that route. I had heard about leaving the wood in your house for a few days beforehand because I have been thinking about planking my living room ceiling too. I have beams just like yours with a swirly 80’s ceiling in between them. Yuck! I really like that you chose the same color as the hallway for this little hall too. It ties in together nicely and yet the white B&B makes it still feel like a different, albeit complementary, area. I also enjoy a good B&B (both the breakfast kind and the batten kind) and a nice solid light grey so I might be partial in thinking this is a nice look. 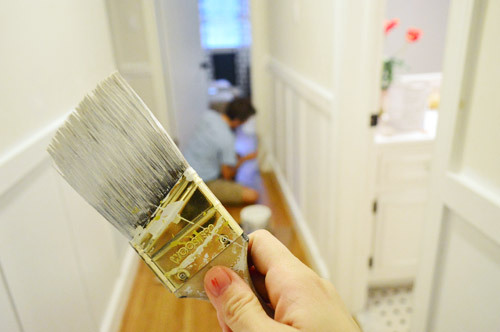 We just started painting our addition last night (eek! We’re finally painting!) and I already really like the color we chose. I even put up a “tutorial” on my blog on how to chose a paint color. Maybe it’s slightly sarcastic. Love it!! We actually JUST finished putting up board and batten in our little eating nook (it’s about 7’x7′), and we have been thrilled with the results! One of the things that surprised us was how big it made the space look! It looks fantastic in a hallway, too, though – maybe it will have to find its way into our next house. Well done! so great! i like how you can do something like this to make a very bland house into something architecturally interesting and beautiful! thanks for the step by step directions. I am thinking of doing this int my hall and stairwell to break thinks up but I am not sure how it should look over stairs and I am certain it would double the work! Oh no! So sorry about that glue fiasco Krista! Sounds like lots of hard work. I’m a little surprised to see you guys don’t put down anything to protect/cover the floor while painting the walls. Is that the norm or an exception? Looks fab! 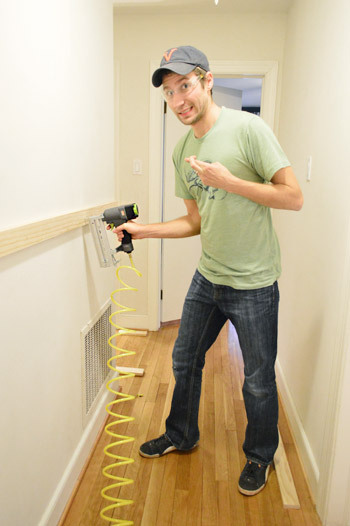 I love our nail gun too. One tip I have for those looking to buy tools is check Craigslist before you buy – you can often find good, well taken care of tools for much less than new as people often buy things, use them once or twice then realise they don’t need them. We got our nail gun and compressor for $20 that way. I just picked up a new (used about twice) reel mower that I was about to spend $200 on at Lowes for half that price. Sometimes it means driving a few miles, but we often work it in with a trip that had to be run or get to visit a new area. Always worthwhile checking the CL! This looks so great! I have a question though, for if I ever try to tackle this. Your walls look super smooth in the pictures. Is there much texture to them? Even if they aren’t textured, would this project look the same if there was texture to the walls? I feel like every house I’ve ever lived in has had super textured walls. I feel like it would take away from the board-look. Thanks guys! Keep up the awesome work! Oh yes, if you click the link to Kate’s project that we included in this post, she did it on textured walls, so she has lots of tips for ya! There’s just something so classy about white board & batten. Love it! I love the look! I’m wondering if it doesn’t feel sort of “out of the blue” though? Why not carry it through the frame hallway also? At this point I’m planning all the renovation I want do to in my house… And you’re an inspiration! I didn’t know what to do in a hallway I have back at the bedroom’s area, because it’s very long but it’s narrow, so I can not put any furniture… It’s very naked! So I love this idea, hope my husband does too! Do you think that this option it will look good if I put in all the hallways???? I just have 2… It’s an apartment!!!! I think you’ll hear from me more often! Hahahaha! Oh yes, I think it would look gorgeous! Good luck Mafalda! Ca-lassy guys! You’re hallway has on its fancy pants! I love it! The tutorial was really great, thanks! I’m gonna need you guys to do it down some stairs next so I can know how to do that too! I’ve got one boring hall going down to our basement. Haha! Fancy pants are my favorite kind of pants. Wow! The side by side before and after photos really show the impact of this project. 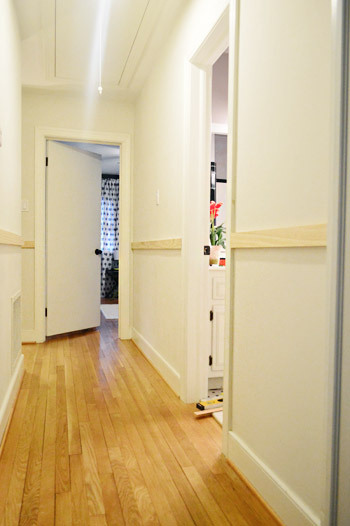 I cannot believe how much character those boards added to the hallway. It’s remarkable! Aw thanks Stacey! We’re even more shocked in person- it really is one of the biggest bangs for our bucks that we’ve ever gotten! This is a phenomenal tutorial. I have been dying to do this since I saw this done at my friend Ryan’s house. Now that you have given such a great tutorial, I am going to get crackin. My big question though, I am planning on just accenting the dining area in my living/dining room. But now that I am seeing this, would it just be better to extend this throughout the room? Thoughts? Ooh I think it could look lovely either way! Throughout the room would be amazing if you’re up for it! Loved this post. What motivated you to wait to prime the rails after you nailed them in? My first instinct would have been to prime them before. I’m assuming since it’s an indoor project it doesn’t make too much of a difference. Just curious! It could totally go either way, but in our case it was nice to put them in place and then prime them instead of having to create another area in the house to lay them all out and prime them (we got to work within one “messy zone” and then clean that once the project was done instead of spreading it out all over the house – haha! It looks SOOOOOOOOOOOOOOOOOOOOOOOOO good! 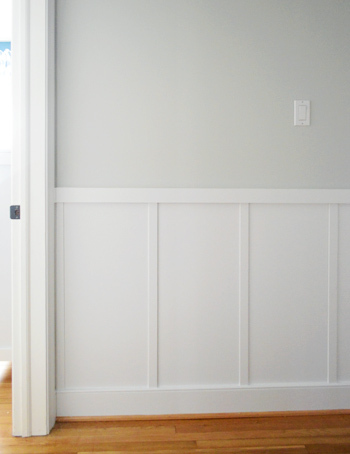 And I love the timing of it because we literally just finished painting our guest room and had decided to do board and batten on the lower half (replacing the existing chair rail!) So now we have your tutorial to go off of too! You mean all this time y’all didn’t have an air nailer? Oh wow! You’re projects are really going to fly now! Thanks for the link to the air nailer, I’ve added it to my registry ;). 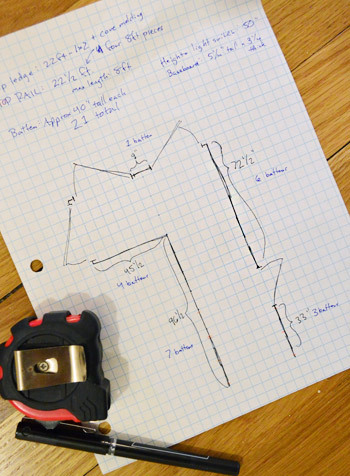 I used to use one all the time in high school at my parents for 4-H Woodworking projects, and for some reason I forgot all about it, or thought a little setup would be too expensive. The Evolv line looks like it gets decent reviews. Have fun (not) hammering away! I know, right? 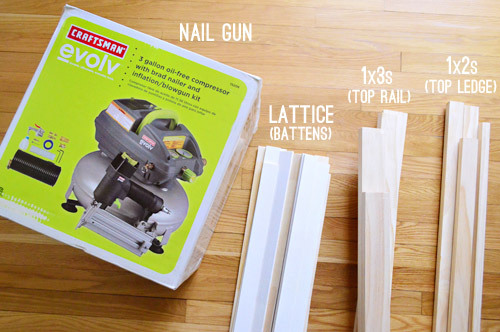 John built an entire deck and reno’d our first bathroom all without an air nailer! Insanity! hey guys…i’m not commenting for you to publish this…not to be creepy..but i think your address is on the cardboard box…on the painting vid. JUST telling you incase you aren’t aware of that. Maybe you don’t care… anyways..i love the video’s..so helpful!! It looks great. I’d say it’s more of a ‘batten’ job or ‘faux board and batten’, but I guess if you consider the top rail the ‘board’. I recently did bead board in a small bathroom and it wasn’t that cheap so that’s great you can skip the ‘board’ part. My walls are all textured. 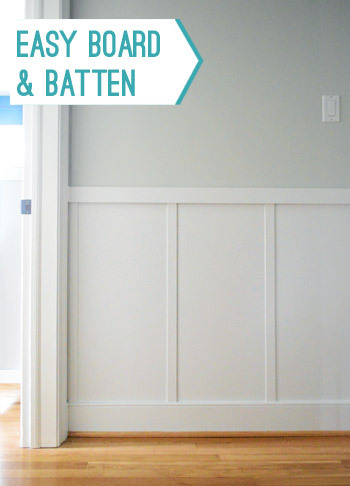 It’s interesting that battens are used to hide/seal board joints but the look is so cute we can put battens up right over an un-jointed wall and it looks upgraded! Haha! Nope, you’re not alone! I cannot get over how amazing this looks!! It gives me butterflies! I am sending it to my boyfriend’s email right now! He is gonna hate me….. because i’m totally adding a project to his list! Ha! 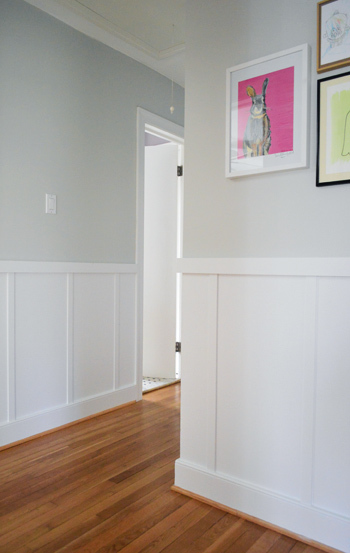 Oh yes, we have more little hallway updates to fill you guys in on (just had to get to the board & batten stuff first since it was “due” for the Pinterest challenge!). Wow, that is the best $57 you’ve ever spent. Love it and I especially like the lattice, not all of us have huge homes and lattice is a great substitution. You guys ROCK! What a FANTASTIC space changer! A lot of “BANG” for not a lot of buck. Added bonus is if you want to hang something a little heavier on the walls you’ll know where all the studs are located just by using the location of the battens. John is a handsome man, but in his glasses he is VERY handsome. Hah, it’s true about the glasses and about easily finding the studs. Love it! What a beautiful job you’ve done. I can’t wait to watch videos when I get home because I am convinced that I need to do this in my own hall way. A question about the nail gun . . . does the $70.00 include the compressor? I’m sure I could go online to HD and find out myself but, thought I’d ask you anyway. That’s totally affordable. I know what I’m buying this weekend! Someone probably already asked this, but what did you do with the large vent on the wall? Paint it the same color? Spray or regular? Yup, just painted it while we had the roller and brush out the same way as the trim and the walls. Wow! This is a really thorough tutorial! Thanks for making it seem so easy. 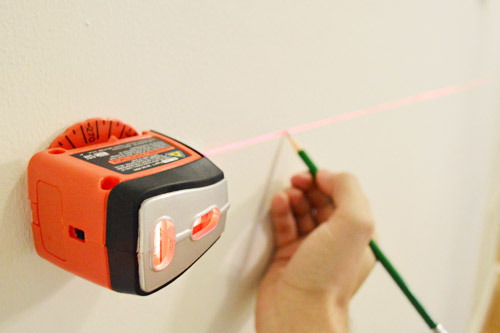 I am really itching to do this in our hallway now! Nice job guys! I like that you didn’t add the ledge at the top – I agree that it would’ve looked too cramped in your narrow hallway. 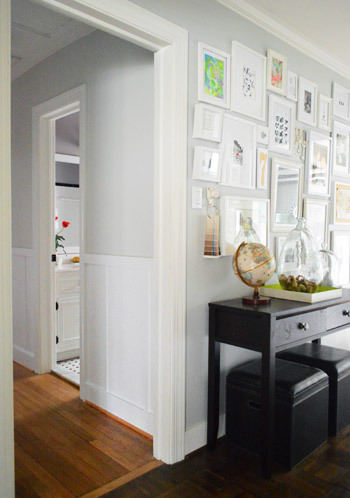 The photo of the look-back into the frame hallway really shows how gorgeous this all looks! Love it! Now you put the idea in my head. And not that expensive either. With a one year old running around, I almost need this to keep it clean. Wow, you really had me fooled. From how clean the pictures look, I really thought you had put a board behind the lattice. I can’t believe it’s just paint! I understand now why you can do this method with non-textured walls. Our walls are textured, but I would love to see this in the hallway from our garage to the living room (it’s the only hallway we have). Great job! It looks fantastic! Now I’m thinking of places I could do this…! The only question I had was how you handled the corner? 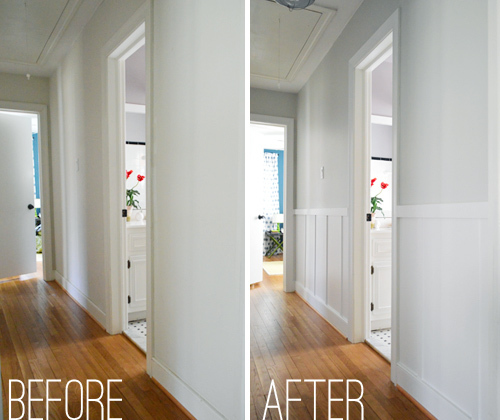 I couldn’t really see from the photos (did you miter it or just caulk it up?). We actually didn’t miter it and just used caulk since it butted up nice and tight after we nailed it all in! Looks nice and seamless now! Did you use the Advance paint on the walls as well? Considering this for a bathroom. PS Love your house and all the colors. Got a sample of Moonshine for said bathroom, reads green there. Funny how paint works. We just used the Moonshine we had already (in Natura, which is also nice for coverage and durability as well as bring no VOC). Looks great. 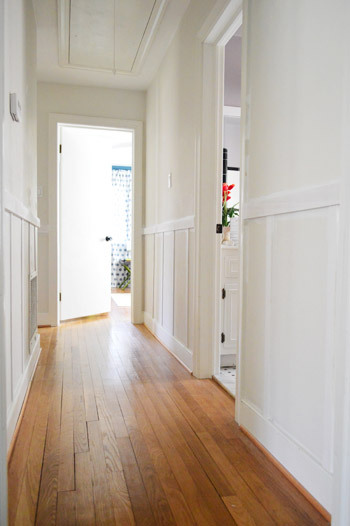 This has been on my list for a long time too for my bowling alley of a hallway – have been waffling between b&b and more traditional wainscoting, but the b&b seems so much easier and probably cheaper. 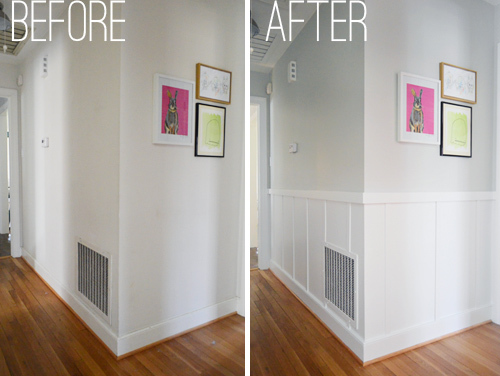 Love the use of lattice to get around the skimpy baseboards without replacing (yours are nice, mine are the builder basic skinny ones). I have a question. 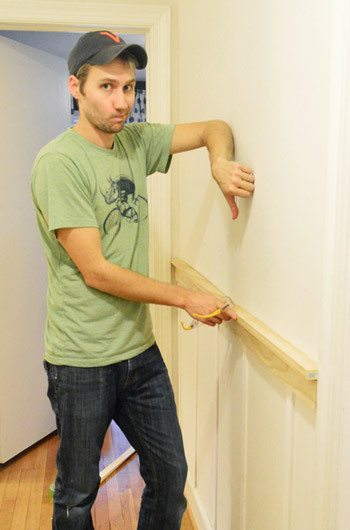 You mentioned that you leveled the top rail with a level as opposed to using the floor or baseboard as a guide. My house is very old (early 1900s) and the floors in some places are not level at all–would it be better to: 1) have the top rail actually level (using a level) but appear not level compared to the floor/baseboards or 2) measure from the baseboards/floor so that the rail is parallel with them but not actually level? Maybe in an old crooked house, it is better not to do anything like this that might draw attention to the uneven lines! Thank you! Hmm, I would meet in the middle I think. I bet if you go right between being “level with the floor” and “actually level” it might appear to all be nice and balanced. Here’s hoping! So stoked about your new toy, too. Every time I show my husband projects on your site, he says, “That man needs a nail gun, stat!” He’ll be so happy for you.